In 1884 at East Raymond, nine ladies and five gentlemen of the town met to form a Benevolent Society which was variously referred to as the "Ladies Benevolent Society" or "Ladies Sewing Circle." Within three years membership had grown to forty men and women. Records of the society show that, at a meeting held December 22.1887, it was voted that the funds of the Society (collected by dues) be used for building a church, chapel, or vestry at East Raymond. On September 6.1888 the Society's minutes report, "A goodly number present - decided to build a Chapel to consist of two rooms built on one floor." During the following year, members contributed time and material for grading the lot obtained from Orrin and Henry Lane and Lester Jordan on the present Route 85 site. Interested citizens also contributed generously to building the Chapel. In August of 1889, "the usual exercises of a 'Circle afternoon' were varied by a visit to the new Chapel to see how it was progressing and give our advice, if any was needed." 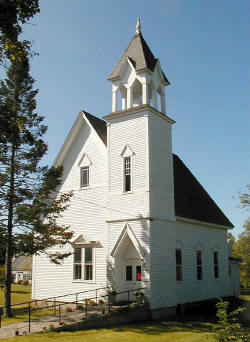 The East Raymond Chapel was completed in 1890. In July of that years the Ladies Benevolent Society voted to become responsible for all debts incurred in furnishing the inside of the Chapel. The East Raymond Chapel was rededicated to the Glory of God on its 100th anniversary year August 12, 1990. For more information, please contact the Church Office of Casco Village Church at 207-627-4282 between 9 AM and Noon, Monday through Friday.